I have just installed lining on the hand break and it seems too tight. Is there a way to shave it down to fit? Drum is hot after a short drive. Any suggestions to make it fit? Thanks for any help. I would suggest first to doublecheck the length of your brake rods to make sure that the brake cams are in their fully relaxed (horizontal) position when the brake lever is fully forward (trans in high gear). Jam a piece of wood or something in the brake handle slot to make sure that the handle won't get pulled back when you are fiddling with the rods. If the brakes still drag after doing the above, then you may have to resort to touching up the shoes with some kind of sander, hopefully they'll just be high in a couple of spots that can be easily dressed down. Wear a mask so that you don't breathe in the dust. I just installed a Ruckstell on my '26 Touring (see profile photo). 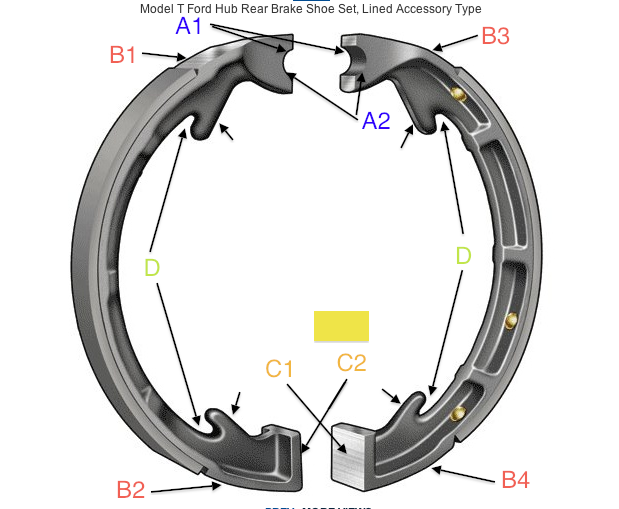 I had a pair of newly re-lined e brake shoes that I had on hand. When I assembled the old drums on the new shoes, we found that they were dragging. The first thing I thought was new linings, cams, gonna' have to grind them down a little. Upon further inspection, we found that the shoes, which are nothing more than rolled metal channel, were out of round. When we did a little tweaking to get the shoes back to round, there was no more dragging. Nick, if you've just installed the repro lined handbrake shoes and they are too tight, the casting might need to be adjusted slightly to get the fit correct (so the shoes retract far enough AND sit concentric to the drum). I went through this a couple months ago. Sadly, I took no pictures, so my notes on the generic illustration below are from memory and may well be incorrect in parts. All my adjustments were made to the castings, none to the lining. A1 or A2 (one or the other): pivot pin recess was made slightly deeper and offset on one direction or other (A1 or A2) to centre the shoes within the drum. B1, B2, B3, and/or B4: I ground a little off several of these surfaces to ensure clearance to the drum even after the lining had worn in a bit. C1 and C2: I ground a bit off both faces to allow the shoes to retract a little further. If you take off more than necessary, you can compensate with your brake rod adjustment. D (4 places): all these hooks had to be opened up so the retraction springs would fit properly. Tip: if you have a spare drum and rear hub, this will be handy for fitting the shoes � bolt together and leave out the key then slip the hub/drum on and off when checking for shoe clearance and fit. I had one on my 26 which was dragging and found it to be a bent backing plate. When the hub was tightened on the taper, the outside edge of the drum was scraping on the shoe. I thought I would need to grind the shoe, but discovered that it wasn't the shoe, but the backing plate was pushing the shoe away from the backing plate toward the drum. Straightened the backing plate and the dragging stopped. You don't say what year you have, but the 26-27 are the only ones that came with lined shoes. They are also the only ones with sheetmetal backing plates which can easily be bent if the wheels have been pulled off and you are storing or working on the rear axle assembly. If you are installing lining on the original shoes of earlier cars, the linings will make them too tight. There are replacement lined shoes available from vendors for the earlier models. But those will need some grinding to make them fit too. Here is another thing to check. In some cases the dragging brakes are caused by the brake rod pushing back on the brake arms. When the brake lever is pushed all the way forward it is also pushing back on the brake rods because there is no slack in the stock system. 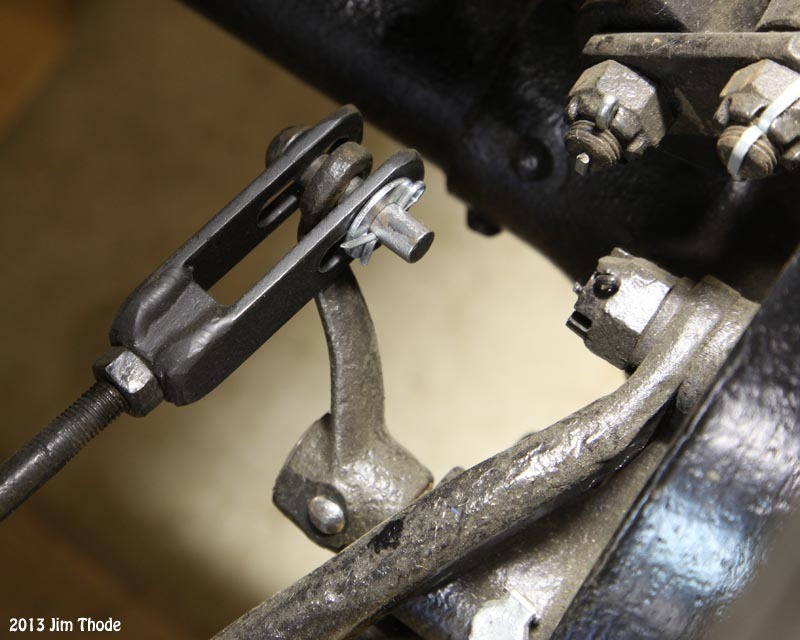 The easy fix is to install brake rod clevis's with elongated slots in them. This prevents the dragging brakes caused by the rods from pushing back on the brake arm when the brake lever is in the full forward position. They work great. I recently installed some of the new cast iron brake shoes with linings. Chris is right about needing to grind them to fit, especially on the A parts. Believe it or not, they are a big improvement over the ones that were available a few years ago. Those took a lot of grinding. Where did you get the sliding brake rod clevis' ? I made the clevises. I think I used a 1/2 square rod, drilled and taped it for the threaded rod and welded the side plates on with the elongated holes. Thanks for all the suggestions. I failed to say this is a 26 with single shoe with lining. I thought I might grind some off of the end or ends of the shoe so that the thickness of the activation cam won't keep the ends of the shoe so far apart causing the rubbing. Does this seem like a good fix? Next is to solve a bearing leak onto the other side lining. Nick, have you had the rear axle out and open? The oil leak makes me suspect a worn bearing has damaged or displaced the seal. And that suggests there may be other things in there that require attention. Try taking off the rods and see if it still drags. It could be that the rods need adjusting. The lever on the axle should be free and the springs inside the brake shoes should pull them together. If it still drags, you need to use something like chalk on the shoes and see if you can find exactly it is dragging. Something could be bent or high spots. If the wheels still turn but just drag, you could try driving it for a short distance and pulling back the brake lever to slow down the car. Only do for short distances and let the drums cool. After you do this a few times it could settle down. If not, then would be a time to do some grinding. But you do need to find out just where the binding is and do as little grinding as necessary to free it up. I've recently installed the repro linings on my 26 without any problems. With the brake rods disconnected, the drum should be quite loose over the shoe and lining. Only notable thing is the lining tends to stick out at the end because it wants to revert to its original shape. It rubs against the drum at this point but as the area of contact and amount of pressure are minimal, it didn't bother me. Took a long drive for the linings to wear in, and still not convinced they work as well as the original. I hope there's no asbestos in them because there was a bit of dust when drilling them.